Our house is filled with mementos from our families, loved ones now departed. We have furniture and art from both our parents. China and crystal abound in our dining room, filling two china closets and our built-in buffet. There is a desk built by Larry’s great-grandfather and a small rocker that my great-great-grandfather fashioned for his daughter so long ago. But it was Mama’s sofa that claimed an extra special place in my heart. After my mother died in 2007, I had the arduous task of emptying out her condo, chock full of “stuff”. Once I had shared many of her lovely things with friends and family, I gathered what I had set aside for myself. 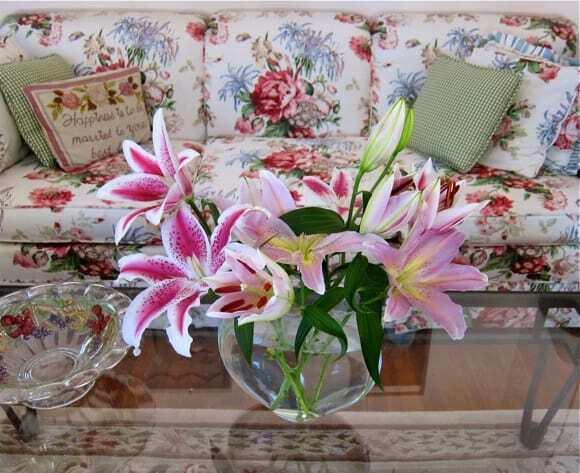 There was a beautiful china closet, a marble side table, books, china and crystal, kitchen ware – and her pretty little sofa. When my father had died in 1991, Mama began the hard path of rebuilding her life. She took in her aunt, moved into our neighborhood and treated herself to the sofa of her dreams, custom-made and quite a splurge. She enjoyed that sofa for many, many years and made it the center of her living room. After my mother was diagnosed with lung cancer, I began spending a lot of time with her in her condo, often times with both of us on her sofa. Mama would lie back on her pillow with her feet in my lap. I would read aloud, or we would listen quietly to NPR. Often, we would reminisce about our lives together, sharing many special memories. I thought I could never, ever part with my mother’s sofa, despite its age and slightly dilapidated state. Our kitties napped on it and they had done some damage as well. But then one day, I suddenly thought, “Let’s buy a new sofa”. Larry and I had just remodeled our only bathroom and I was on a tear, cleaning and freshening up the house. And, just like that, we did. Our gardener of over 25 years (who knew my mother) has a large, extended family in Tijuana and some folks there now have Mama’s sofa. I hope it makes them as happy as it did our family. 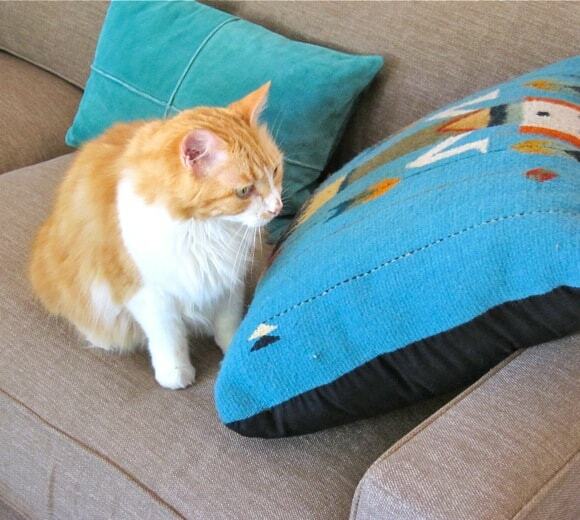 Our kitties inspected the new sofa, once Daisy pronounced it suitable for napping. I’m settling in a bit more slowly, reminded that grieving is a journey of a thousand steps. We all move ahead at the pace our heart dictates. I don’t need your sofa any more, Mama. You are always, always with me. Your memories with your mom with always be with you, even without the couch. I love the new look. Love the accent of blue. What a breath of fresh air! Thanks, Elizabeth – I admit that I couldn’t watch it go out the door. You are so right, Wendy – thanks for “listening”. We heard in a class once, there is a time to let go of “objects” so take a picture and give it a new life. This is what you did, and as you say. Someone else now gets to enjoy the joyfulness and cheeriness of your mom’s sofa. You will always have the memories and photos to keep close to your heart. Aw – nice, Greg – and they are tightly bonded. Oh, Liz. What a beautiful tribute. And your cats are precious. 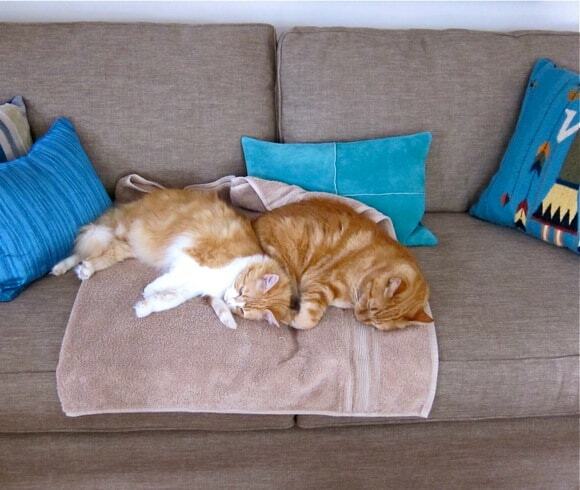 Greg nailed it: They are happy not because of the sofa, but because they are together! Hi, this is my first visit to your site, having seen a comment you left at Greg’s – Sippity Sup. I am so glad took the time to drop in. What a lovely post. I too have my mother’s sofa. It holds, quite literally, lots of memories. I never had the heart to let it go, but we did recover it, trauma enough! Even though your mom’s sofa is gone, it’s the memories in your mind that will remain. Thank you for a beautiful post. It is a pleasure to meet you. I’m so glad you found me – thanks for your thoughtful comment – I am a big fan of Greg and his writing. What a sweet story! Your new couch looks great and I like the old one too. They both fit the space perfectly (especially for your lucky cats). Such a lovely post, and I love your cats. It’s nice to know that another family is enjoying your mother’s sofa. I just found your blog to read your beautiful touching post. Your memories of your mom will always be with you. Such a thoughtful and supportive comment -thank you, Lisa. I love this post, Liz. Belatedly. It’s a beautiful tribute to the warm relationship you and your mother shared. You were both so lucky to have each other to enrich both of your lives. It’s wonderful that you know who is using that special sofa now. There’s no way you could cast if off carelessly. 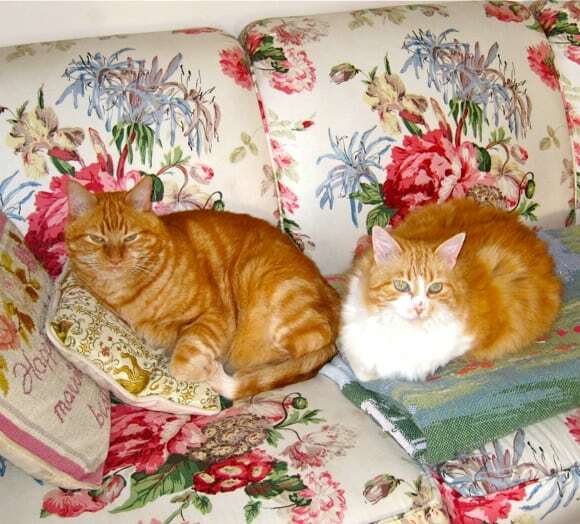 And I love, love, love the photos of the kitties on the sofa. So, so sweet. What a heart melting rendering of your relationship with your mother. It moved me and it reminded me of her in so vivid a way. 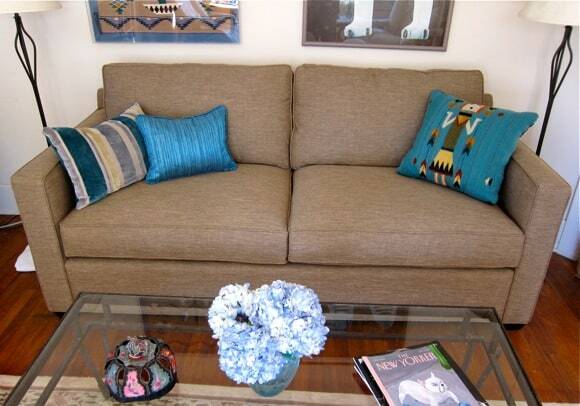 When I opened this site and saw the sofa, I actually gasped. It was like seeing her again. That fabric was exquisite and so exquisitely her. Your description of sitting on the sofa with your mother was a great comfort to me. I felt so very far away when she died and so helpless. Picturing you two on the sofa brings on a secret smile. I have always known how very much you loved her and knew you were there for her last illness, but having that vivid picture of you two on the sofa has made your presence there so much more real. It is a picture I will always have and will always cherish. I am so happy that you wrote this for all of us.